by Chris Woodford. Last updated: March 27, 2018. No cellphones, laptops, or flashlights. No electric cars or robot vacuums. No quartz watches, pocket calculators, or transistor radios. And, for those of us who need a helping hand with our daily lives, no heart pacemakers, hearing aids, or electric wheelchairs. Photo: Disposable batteries like this one are really convenient, but they can be expensive in the long haul and they're bad for the environment. A better option is to use rechargeable batteries. They cost more to begin with, but you can charge them hundreds of times—so they save an absolute fortune and help save the planet. A battery is a self-contained, chemical power pack that can produce a limited amount of electrical energy wherever it's needed. Unlike normal electricity, which flows to your home through wires that start off in a power plant, a battery slowly converts chemicals packed inside it into electrical energy, typically released over a period of days, weeks, months, or even years. The basic idea of portable power is nothing new; people have always had ways of making energy on the move. Even prehistoric humans knew how to burn wood to make fire, which is another way of producing energy (heat) from chemicals (burning releases energy using a chemical reaction called combustion). By the time of the Industrial Revolution (in the 18th and 19th centuries), we'd mastered the art of burning lumps of coal to make power, so fueling things like steam locomotives. But it can take an hour to gather enough wood to cook a meal, and a locomotive's boiler typically takes several hours to get hot enough to make steam. Batteries, by contrast, give us instant, portable energy; turn the key in your electric car and it leaps to life in seconds! What are the main parts of a battery? The basic power unit inside a battery is called a cell, and it consists of three main bits. There are two electrodes (electrical terminals) and a chemical called an electrolyte in between them. For our convenience and safety, these things are usually packed inside a metal or plastic outer case. There are two more handy electrical terminals, marked with a plus (positive) and minus (negative), on the outside connected to the electrodes that are inside. The difference between a battery and a cell is simply that a battery consists of two or more cells hooked up so their power adds together. When you connect a battery's two electrodes into a circuit (for example, when you put one in a flashlight), the electrolyte starts buzzing with activity. Slowly, the chemicals inside it are converted into other substances. Ions (atoms with too few or too many electrons) are formed from the materials in the electrodes and take part in chemical reactions with the electrolyte. At the same time, electrons march from one terminal to the other through the outer circuit, powering whatever the battery is connected to. This process continues until the electrolyte is completely transformed. At that point, the ions stop moving through the electrolyte, the electrons stop flowing through the circuit, and the battery is flat. "It is the difference in metals that does it." Alessandro Volta (commenting on Galvani's experiments). Why do batteries need two different materials? It's important to note that the electrodes in a battery are always made from two dissimilar materials (so never both from the same metal), which obviously have to be conductors of electricity. This is the key to how and why a battery works: one of the materials "likes" to give up electrons, the other likes to receive them. If both electrodes were made from the same material, that wouldn't happen and no current would flow. To understand this, we need to delve back through the history of electricity to 1792, when Italian scientist Luigi Galvani found he could make electricity with a bit of help from a frog's leg. 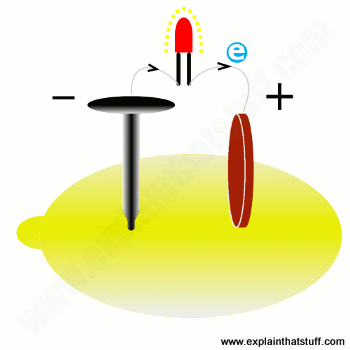 Artwork: Have you ever made a simple battery by pushing a zinc nail and a copper coin into a lemon? It works because these two different metals have atoms with different abilities to hold on to the electrons they contain. The zinc atoms in the nail lose their electrons (blue, e), which flow out through the circuit you've made to the copper atoms in the coin. This flow of electrons makes a current that delivers useful power, capable of lighting up a tiny bulb or LED (red). Read more about how to make a lemon battery and the chemical reactions that power it. Famously, Galvani stuck a couple of different metals into the leg of a dead frog and produced an electric current, which he believed was made by the frog releasing its "animal electricity." In fact, as his countryman Alessandro Volta soon realized, the important thing was that Galvani had used two different metals. In effect, the frog's body was working as the electrolyte of a battery made with two different metallic electrodes stuck into it. Dead or alive, there was nothing special about the frog; a glass jar full of the right chemicals—or even a lemon—would have worked just as well. What was so special about the electrodes? Chemical elements differ in their ability to pull electrons toward them—or give them up to other elements that pull on them more. We call this tendency electronegativity. Stick two different metals into an electrolyte, then connect them through an outer circuit, and you get a tug-of-war going on between them. One of the metals wins out and pulls electrons from the other, through the outer circuit—and that flow of electrons from one metal to the other is how a battery powers the circuit. If the two terminals of a battery were made from the same material, there'd be no net flow of electrons and no power would ever be produced. That's the theory anyway. Now let's look at it in practice. How does a battery really work? Where does the power in a battery actually come from? Let's take a closer look! 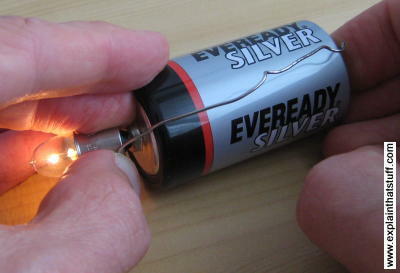 Here's my battery hooked up to a flashlight bulb to make a simple circuit. I've unwrapped a paperclip to make a piece of connecting wire and I'm holding that between the bottom of the battery and the side of the bulb. If you look closely, you can see the bulb is shining. That's because electrons are marching through it! Now here's what's going on inside. The battery's positive terminal (shown just above my left thumb in the photo and colored red in the artwork below) is connected to a positive electrode that's mostly hidden inside the battery. We call this the cathode. The outer case and the bottom of the battery make up the negative terminal, or negative electrode, which is also called the anode and colored green in the artwork. The paperclip wire is represented in the art by the blue line. Let's quickly clear up one point of confusion. At school, you may have learned that the cathode is the negative electrode and the anode the positive electrode? However, that really applies only to things like electrolysis (passing electricity through a chemical to split it up). Batteries are like electrolysis going backwards (they split up chemicals to make electricity) so the terms anode and cathode are switched around. Okay? To avoid confusion, I suggest it's best not to use the terms anode and cathode at all. It's better to say "positive terminal" and "negative terminal" and then it's always clear what you mean, whether you're talking about batteries or electrolysis—or anything else with a cathode. Now back to our battery. The positive and negative electrodes are separated by the chemical electrolyte. It can be a liquid, but in an ordinary battery it is more likely to be a dry powder. When you connect the battery to a lamp and switch on, chemical reactions start happening. One of the reactions generates positive ions (shown here as big yellow blobs) and electrons (smaller brown blobs) at the negative electrode. The positive ions flow into the electrolyte, while the electrons (smaller brown blobs) flow around the outside circuit (blue line) to the positive electrode and make the lamp light up on the way. There's a separate chemical reaction happening at the positive electrode, where incoming electrons recombine with ions taken out of the electrolyte, so completing the circuit. The electrons and ions flow because of the chemical reactions happening inside the battery—usually two of them going on simultaneously. The exact reactions depend on the materials from which the electrodes and electrolyte are made. 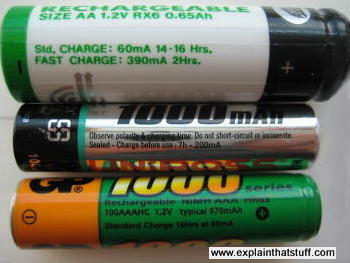 (Some examples are given further on in this article where we compare different types of batteries. If you want to know more about the reactions for a particular battery, enter the type of the battery you're interested in followed by the words "anode cathode reactions" in your favorite search engine.) Whatever chemical reactions take place, the general principle of electrons going around the outer circuit, and ions reacting with the electrolyte (moving into it or out of it), applies to all batteries. As a battery generates power, the chemicals inside it are gradually converted into different chemicals. Their ability to generate power dwindles, the battery's voltage slowly falls, and the battery eventually runs flat. In other words, if the battery cannot produce positive ions because the chemicals inside it have become depleted, it can't produce electrons for the outer circuit either. Now you may be thinking: "Hang on, this doesn't make any sense! Why don't the electrons just take a short cut and hop straight from the negative electrode through the electrolyte to the positive electrode? It turns out that, because of the chemistry of the electrolyte, electrons can't flow through it in this simple way. In fact, so far as the electrons are concerned, the electrolyte is pretty much an insulator: a barrier they cannot cross. Their easiest path to the positive electrode is actually by flowing through the outer circuit. Batteries come in all different shapes, sizes, voltages, and capacities (amounts of stored charge or energy). Although they can be made with all sorts of different chemical electrolytes and electrodes, there are really only two main types: primary and secondary. Primary batteries are ordinary, disposable ones that can't normally be recharged; secondary batteries can be recharged, sometimes hundreds of times. You can recharge secondary batteries just by passing a current through them in the opposite direction to which it would normally flow (when it's discharging); you can't normally do this with primary batteries. When you charge your cellphone, you are really just running the battery (and the chemical reactions inside it) in reverse. 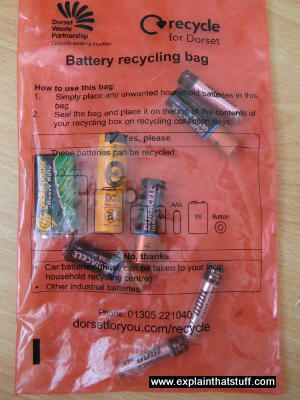 Photo: A selection of disposable (primary) and rechargeable (secondary) batteries I've just gathered up from my home. 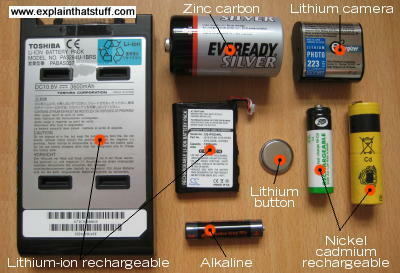 The zinc-carbon, alkaline, and lithium camera batteries are primaries. The nickel-cadmium and lithium-ion batteries are secondaries. You might think single-use, disposable batteries are rather nasty and old-hat; since we have to throw them away, they work out expensive to use and they're anything but environmentally friendly. Even so, they have a major advantage: they generally store much more energy and last significantly longer than rechargeables the same size. You'll have noticed this straight away if you've switched from using disposable to rechargeable batteries in something like a flashlight. Yes, you save a lot of money (rechargeables cost almost nothing to charge up) and you're helping the planet, but you'll need to recharge your batteries much more often than you'd need to replace disposables. Sometimes that doesn't matter at all (it's easy enough to have two sets of rechargeables and keep one set always charged); other times, it's crucially important: heart pacemakers, for example, have surgically implanted, disposable lithium batteries inside. It's simply not practical to keep cutting open someone's chest just so you can recharge their pacemaker batteries! In short, while it's best to use rechargeable batteries if you possibly can, there are times when disposable batteries are better. The three main kinds of primary batteries are zinc carbon, alkaline, and lithium. Since there's no liquid in them, they're often referred to as dry cells. The cheapest, ordinary, everyday batteries you get for things like flashlights are zinc carbon ones. Disposable zinc-carbon batteries date back to about 1865, when they were invented by French engineer Georges Leclanché; that's why they're sometimes referred to as Leclanché cells. Although they're inexpensive, they don't store that much energy or last that long. "Zinc-carbon" is essentially a description of how the battery is made: the positive electrode is made from a carbon rod surrounded by powdered carbon and manganese (IV) oxide; the negative electrode (the outer case) is a zinc alloy; and the electrolyte is a paste of ammonium chloride. When a zinc-carbon battery is wired into a circuit, different reactions happen at the two electrodes. At the negative electrode, zinc is converted into zinc ions and electrons, which provide power to the circuit. At the positive electrode, manganese (IV) oxide turns to manganese (III) oxide and ammonia. 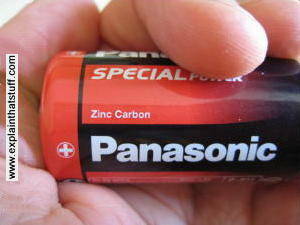 Photo: The cheapest batteries are usually made from zinc and carbon. Alkaline batteries look much the same as zinc carbon ones, but pack more punch: they store more energy and last longer, which is why they cost more. They stay charged for several years, which makes them a very dependable source of power. Although they look exactly the same as zinc carbon ones, they use different chemicals and different reactions take place inside them. The positive electrode is based on manganese (IV) oxide and the negative electrode is made of zinc, but the electrolyte is a concentrated alkaline solution (potassium hydroxide). Power is produced through two chemical reactions. At the positive electrode, manganese (IV) oxide is converted into manganese (III) oxide and hydroxyl ions. At the negative electrode, zinc reacts with the hydroxyl ions to release the electrons that power the circuit. Many button-cell batteries (widely used in things like quartz watches and hearing aids) work the same way as ordinary alkalines, with similar electrode materials and alkaline electrolytes; others use lithium and organic electrolytes and work through different chemical reactions. Look closely at a button cell and you'll see that the top central section forms the negative electrode, which is made from either zinc or lithium. The outer case and bottom form the positive electrode, typically made from manganese oxide, silver oxide, or copper oxide. Once, button batteries commonly used mercury oxide and graphite as the positive electrode, but mercury is toxic so it's now largely been withdrawn from batteries because of health concerns. We don't often refer to "secondary" batteries; it's much more common to talk about rechargeables. Until portable gadgets like cellphones (mobile phones) became popular, in the 1980s and 1990s, rechargeable batteries were relatively uncommon in things like flashlights and toys, because they didn't last anything like as long as disposable ones; most were either nickel-cadmium (or, occasionally, nickel-metal-hydride). In those days, by far the most common rechargeable batteries were the lead-acid "accumulators" used in cars. This a quick overview of rechargeables. You can read more in our main article on how battery chargers work. Tried, tested, and trusted, lead-acid batteries have been with us since the middle of the 19th century. With an overall rating of 12 volts, they have six separate cells, each producing 2 volts. Crudely reduced to its basic components, each cell has a "spongy" lead metal electrode (negative), a lead dioxide electrode (positive), and a sulfuric acid electrolyte. As the battery discharges, both electrodes become coated with lead sulfate and the sulfuric acid is largely converted into water, while electrons flow out around the external circuit to provide power. Photo: A typical lead-acid car battery (accumulator). If you look closely, you can see the negative terminal (black, marked with a − sign, left) and positive terminal (red, marked with a + sign, right) on top. Lead-acid batteries made it possible to start cars without the help of a dangerous and dirty hand crank. Normally, you never have to recharge them—because your car does that automatically. The battery discharges (gives up a little of its energy) to help the car's gasoline engine start up, and recharges (gets energy back again) when the engine begins generating electrical energy through a device called an alternator. 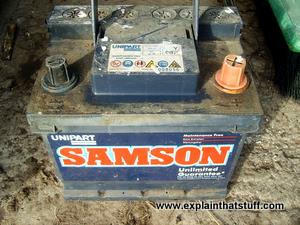 As for disadvantages, lead-acid batteries are relatively big, surprisingly heavy (try lifting one! ), expensive, and can't be fully charged and discharged too many times. Another problem is their use of toxic lead metal, which can cause environmental problems when they're dumped in landfills. Nickel-cadmium (NiCd, pronounced "nicad") are widely used as replacements for disposable 1.5-volt batteries in things like toys, flashlights, and power tools. They're relatively cheap, can be charged and discharged hundreds of times, and, properly treated, will last about a decade. Although very dependable, it's often said that NiCd batteries need to be discharged fully before you charge them up or the amount of charge they will store (and their effective lifespan) can be greatly reduced. Opinions vary on whether this is true and, if so, why it happens, but as a rule of thumb, regularly discharging batteries completely and then recharging them is a good practice. Another problem with NiCd batteries is the toxic cadmium metal they contain. If they are buried in a landfill, instead of properly recycled, the cadmium can escape into the soil and could potentially pollute watercourses nearby. Photo: Don't throw your batteries in the trash! Some batteries contain toxic metals like cadmium, mercury, and lead, but all batteries are made of useful materials that can be recycled into new things. Instead of tossing your batteries away, try to collect them up and take them to a recycling point. Nickel metal hydride batteries work in a similar way, but suffer less from the so-called "memory effect." They became a popular alternative to NiCd batteries in the 1990s, partly because of environmental concerns about cadmium. NiMH batteries work more effectively in gadgets like cellphones, which are often "topped-up" with a quick recharge instead of a complete discharge and recharge (which is more typical with something like power tools). Lithium-ion batteries are the fastest-growing type of rechargeables; there are probably lithium-ion batteries in your cellphone, MP3 player, and laptop computer. What's so good about lithium? It's a lightweight metal that easily forms ions, so it's excellent for making batteries. The latest lithium-ion batteries can store about twice as much energy as traditional NiCd rechargeables, work at higher voltages, and are more environmentally friendly, but don't last as long. Even so, they can be charged and discharged hundreds of times and typically last several years, so they're great for everyday use in electronic gadgets that aren't meant to last that long. How do they work? When you plug a cellphone or laptop into the power supply, the lithium-ion battery inside starts buzzing with chemical activity. The battery's job is to store as much electricity as possible, as fast as possible. It does this through a chemical reaction that shunts lithium ions (lithium atoms that have lost an electron to become positively charged) from one part of the battery to another. When you unplug the power and use your laptop or phone, the battery switches into reverse: the ions move the opposite way and the battery gradually loses its charge. Read more in our main article on how lithium-ion batteries work. These aren't actually batteries at all, though they're similar inasmuch as they produce electrical energy through chemical reactions. You can find out more about them in our separate article on fuel cells. When the battery dies in your flashlight, you go out and buy a replacement. Typically, you just buy one the same size, so it'll fit inside the case. But batteries are like boxes: just as bigger boxes can hold more stuff, so the size of a battery is actually a measurement of how much electrical energy it can store. Why? Bigger batteries contain more chemical electrolyte and bigger electrodes so they can release more energy (or the same energy over a longer period). AAA, AA, C, and D-sized batteries are all rated at 1.5 volts, but they're all different sizes. The bigger ones (D and C) hold more stored energy than the smaller ones (AA and AAA). If you want a more precise idea of how much electrical energy a battery holds, look on the side for a measurement in mAh (milliampere hours, which is a measurement of stored electric charge often printed on small batteries) or Watt hours (a measurement of electrical energy used on bigger batteries). Photo: Bigger batteries generally store more energy than smaller ones. A bigger mAh value means that a battery stores more charge and lasts longer, but it will also take longer to recharge as well. Voltage is the other important measurement marked on batteries. The higher the voltage, the more current a battery will produce when it's connected into a given circuit, which is why this kind of voltage is sometimes called an electromotive force (EMF). The power something like a lamp or electric motor produces (or consumes) is proportional to the voltage across it, so a bigger voltage usually means more power. In other words, high-power gadgets (ones that need more energy and electrical "force") tend to need higher voltages than low-power ones, which is why, for example, cordless power drills (with powerful electric motors) need higher-voltage batteries than simple flashlights (which only have to power little light bulbs or LEDs). 250 BC–AD 224: Some historians claim that the first battery was invented around this time, based on the archeological discovery of iron and copper pieces (resembling electrodes) and a clay jar near Baghdad in the 1930s. Although this discovery is still commonly referred to as the "Baghdad battery" or "Parthian battery" (after the place where it was discovered and the historic period it dates from), other historians doubt whether it would in fact have produced an electric current or functioned as a battery. 1749: US statesman and inventor Benjamin Franklin (1706–1790) first uses the term "battery" to refer to a number of capacitors connected to one another. 1800: Italian physicist Alessandro Volta (1745–1827) invents the Voltaic pile, the first practical battery. He makes it by stacking up zinc and silver discs, alternately, separated by cardboard and soaked in saltwater. 1836: English chemist John Daniell (1790–1845) invents the Daniell cell, a more reliable battery. 1859: French physician Gaston Planté (1834–1889) develops the world's first rechargeable, lead-acid battery. 1868: Another Frenchman, Georges Leclanché (1839–1882), develops the modern zinc-carbon battery. 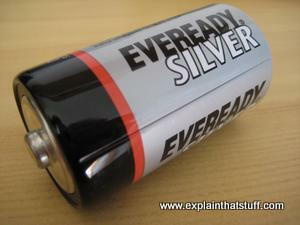 1949: Canadian chemical engineer Lewis Urry (1927–2004) invents the alkaline and lithium batteries for the Eveready Battery company. 1970s: While working at Oxford University in England, German-born American chemist John B. Goodenough (1922–) and his colleagues figure out the science behind lithium-ion batteries. The first commercial batteries using the technology are developed by Sony in the 1990s. 2017: John B. Goodenough patents a battery based on lithium- or sodium-glass that could replace lithium-ion technology in the future. Horrible Science: Shocking Electricity by Nick Arnold. Scholastic, 2000/2018. Battery Science: Make Widgets that Work and Gadgets that Go by Doug Stillinger. Klutz, 2003. Young Discoverers: Batteries, Bulbs, and Wires by David Glover. Kingfisher, 2002. Electric Mischief: Battery-Powered Gadgets Kids Can Build by Alan Bartholomew. Kids Can Press, 2002. Volta's Life and Works: This great website by the University of Pavia has lots of good information about Alessandro Volta's pioneering experiments with electricity and batteries. Miniature Power: How long a step from handie-talkie to hearing aid? by Eric S. Hintz. Chemical Heritage Foundation. A brief history of batteries, from Baghdad to the present day. [Archived via the Wayback Machine]. Will a New Glass Battery Accelerate the End of Oil? by Mark Anderson. IEEE Spectrum, March 3, 2017. John Goodenough, one of the inventors of the lithium ion battery, is now trying to develop something better. Tips and Myths About Extending Smartphone Battery Life by Brian Chen. The New York Times. February 24, 2016. Some smartphone settings help to extend battery life; others make no difference; here's how to tell one from the other. Shaky Battery Maker Claims an Advance by Bill Vlasic and Matthew Wald. The New York Times. June 11, 2012. The fluctuating fortunes of battery maker A123. Can a Polymer Membrane Be the Next Big Thing in Battery Technology? by Dexter Johnson. IEEE Spectrum. October 3, 2011. A new polystyrene-based polymer could prove more effective than conventional batteries and supercapacitors.